Before arriving in Phnom Penh, I spent a lot of time reading about the customs, history and, most importantly, the food of Cambodia. I knew about fried eggs on top of dishes, read about durian, dragon fruit and longan and had been warned about prohok, crickets and tarantulas. But nobody ever mentioned Belgian chocolate. There was nowhere that told me that, on Street 240 in Phnom Penh, I’d find a selection of incredible delights in the shape of pralines, truffles and mendiants – rich, sumptuous bites of milk, dark and white chocolate wrapped around luscious fillings of armagnac, raspberry, caramel and crème de cacao – pure and delicious Belgian chocolate with 73% cacao content from South-American cacao beans. It’s a chocoholic’s dream come true. As with many things in Cambodia, Chocolate by The Shop came about quite by chance. It began in 1999 when Griet Lorré, a Belgian pattern-maker who moved to Phnom Penh with her family, volunteered to help with the catering at her childrens’ school. What began as a part-time opportunity turned into a long-term commitment as, in 2001, she opened The Shop after hiring a baker from Belgium (who came to Cambodia intending to move away from the baking profession) and soon needed an outlet for their bread. The baker stayed eight years and Griet’s hobby of cooking turned into a full-time vocation. 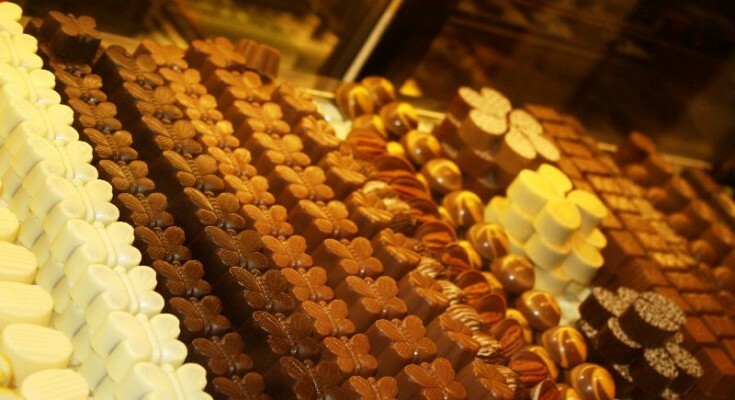 Griet and her team started making chocolates in The Shop, starting with a few simple designs for Christmas and Valentine’s Day then, in 2005, she and her husband Lieven Geerinck, bought the building on Street 240. They were in the process of looking for a tenant for the ground floor space when Griet realized it would be a perfect outlet for the chocolates. They opened in October 2007 with a variety of 16 flavors and now make 33 different types, including such unusual options as Kampot Pepper, Kampong Speu Caramel and Mondulkiri Honey Sesame. “I like to use local ingredients for the Cambodian market,” said Griet. 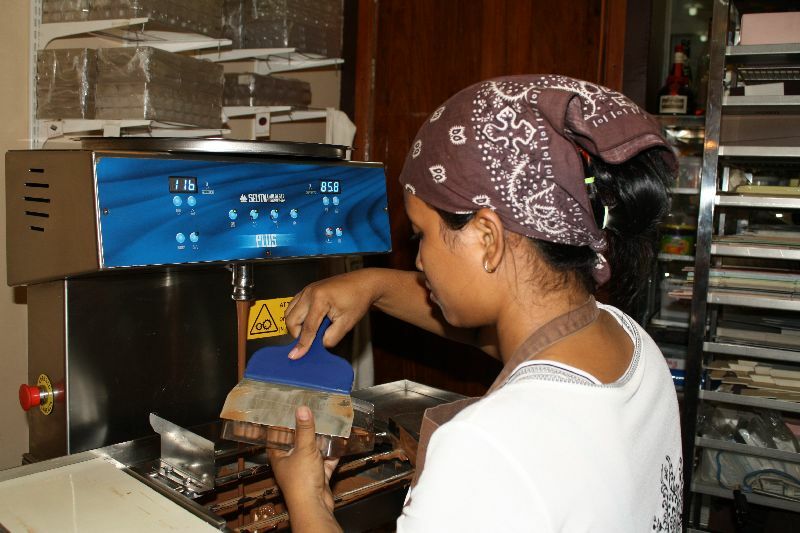 “The favorites among Khmer customers are the white chocolates but the praline is the most popular with everyone since it’s the flavor everyone finds most appealing in a Belgian chocolate”. 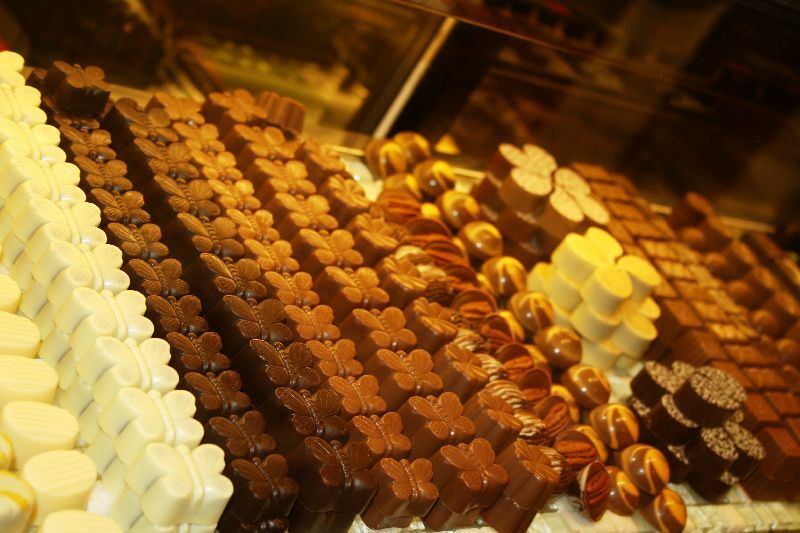 So how are Belgian chocolates made in Phnom Penh? It starts when a thin layer of chocolate is piped into the base of sturdy chocolate moulds (ordered from Belgium) then chilled in a refrigerator. They are then filled with ganache and chilled once again. The last step is to cover the filled mould with another thin layer of chocolate and re-chill one last time. The entire process takes about 90 minutes. And for anyone who’s been in Phnom Penh in February, you’ll know the date when the Chocolate Shop is the most popular place in town: Valentine’s Day. 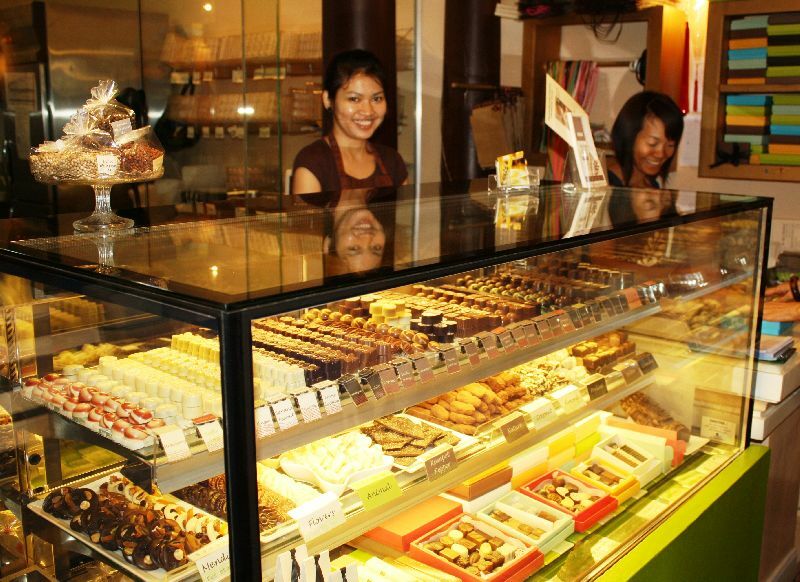 This year, there were 400 advance orders for the customized “chocolate box” (with a name inscribed in chocolate on the lid) and, partly as a result of the business from Valentine’s Day, customer numbers increase every day, with 65 percent of the clientele being Cambodian.